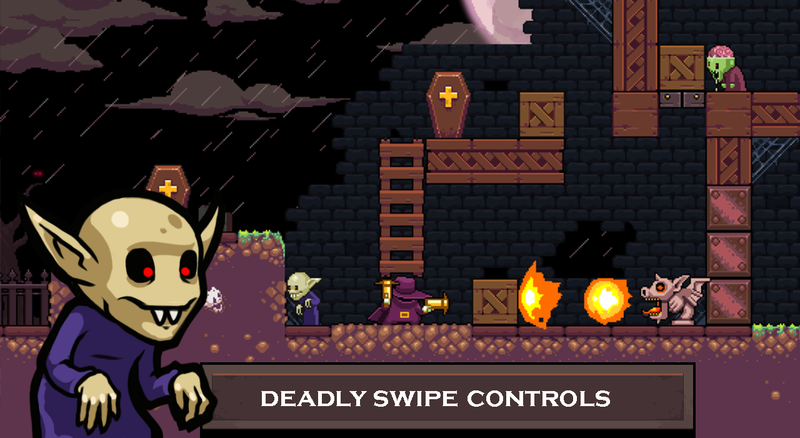 Nitrome has published some fantastic pixel-based games in the past with their releases of Gunbrick, Rust Bucket, Redungeon, and 8bit Doves. That's why it is no surprise to see that their latest release Turn Undead: Monster Hunter is also pretty great. This time around the gameplay focuses on turn-based puzzle platforming in a darkly themed Dracula inhabited world. 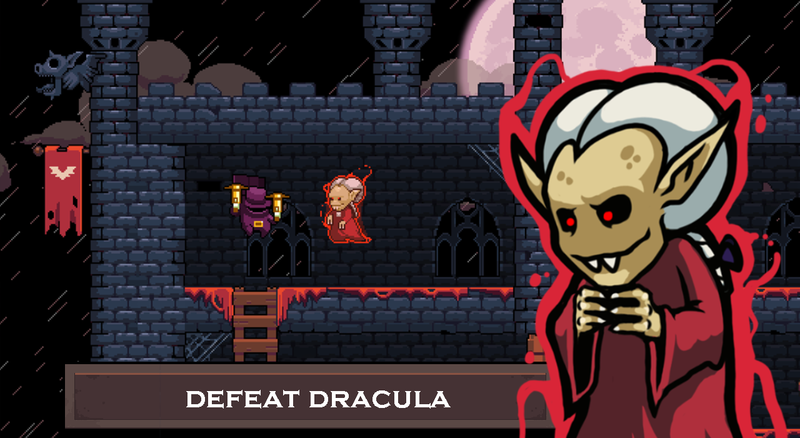 It is your job to take on an army of the undead in order to defeat Dracula once and for all. Okay, so I know Halloween is over, but I couldn't pass up talking about Turn Undead: Monster Hunter despite that fact. It would be doing a disservice to the developers, as this is quite an outstanding release. Nitrone is known for publishing some excellent pixel-based games, and Turn Undead: Monster Hunter does not stray from their expected quality. First and foremost you will notice that the graphics and music are exceptional. 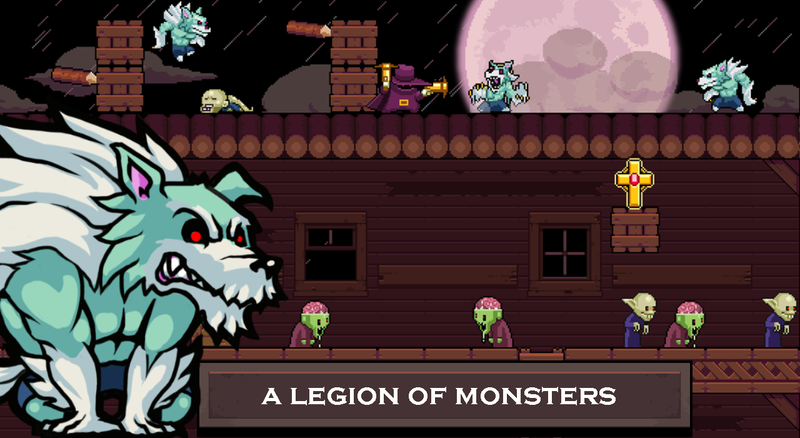 From the cloaked floppy hat wearing protagonist to each individualistic looking monster, there is a lot of charm oozing from this game's design. 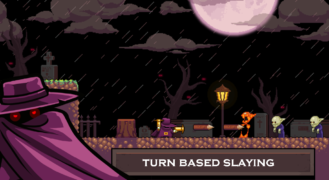 The horror specific music also helps to flesh out the world and makes for some lighthearted creepiness to go along with the detailed pixel-based graphics. The thing is, graphics don't always make the game, which is why we are so lucky that the turn-based puzzle platforming gameplay works so well. Each move you make will be a single turn, much like a roguelike, and yet you are traversing a 2D landscape much the same as you would in any platformer, just a little slower. This design choice allows the game's Sokoban-like puzzles to excel in such an environment. That is because, as you move through each stage you will find boxes that can be maneuvered to your advantage. Sometimes they are useful for reaching new areas, other times they are great for keeping a switch triggered or for blocking enemies and projectiles. But the puzzle-solving is only part of your concerns, as many enemies will be continually coming your way. This means you will need to shoot them down with your trusty stake gun. What is interesting about this mechanic is how the gun works. Any enemy that gets in your way can be defeated by shooting out a stake from your gun towards their direction, but the thing is, the stake is one move ahead of you and does not move forward on its own. You will have to move the character forward in order to make the stake move, which is helpful when your enemies are a few paces in front. Despite the mechanic sounding a bit odd, it works pretty well for the purposes of the gameplay. Now if you are wondering how this title is monetized, you should be glad to hear that it is offered for free with a few advertisements in between rounds of play. This makes it easy to check the game out without going out of pocket, and if you decide you enjoy the gameplay, you can remove those ads with a single in-app purchase of $5.49. I also found that Google Play Games Services are supported with the inclusion of a leaderboard and achievement system, though it does appear that cloud saving is not present. While it's nice to see GPG features included in any new release, the lack of cloud saving is getting harder and harder to swallow, especially when there is an ad removal feature that is priced above $5. Despite the lack of cloud saving and a slightly higher than normal ad removal cost, I would say Turn Undead: Monster Hunter is a game worth checking out. 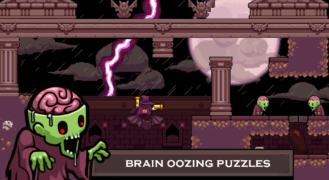 Not only is the puzzle-based platforming pulled off in a fun and intuitive manner, the overall design shows a lot of love went into this title. Considering that the game is free to download, I see absolutely no reason not to install this new release today and give it a whirl.